I've always loved wearing white-on-white looks. Although not the most practical, I still prefer it over all-black outfits any given day. It makes you look polished and instantly elevates even the most casual looks. 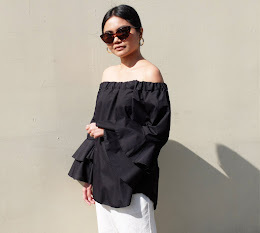 For this ensemble, I teamed my high-waisted shorts with a sleeveless peplum top from Let's Stylize. Business in the front and party at the back― this chic white number is great to wear to fun nights out with the girls and dinner dates with the beau. I especially like how the crisscross open back complements the lace-up detail of my heels.